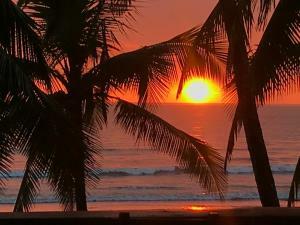 ﻿ Best Price on Costa Rica Surf Camp by SUPERbrand in Jaco + Reviews! 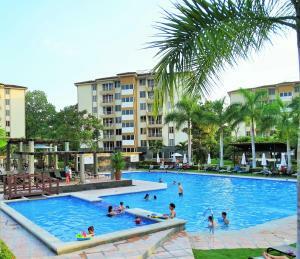 Offering an outdoor pool and a restaurant, Costa Rica Surf Camp by SUPERbrand is located in Jacó. Free WiFi access is available in this resort and a surfing lesson per day is included. The rooms will provide you with air conditioning and a patio. Featuring a shower, private bathroom also comes with free toiletries. You can enjoy garden view from the room. 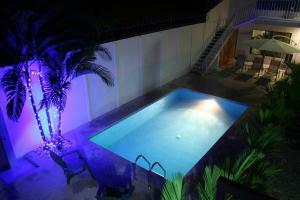 Extras include a private pool, a safety deposit box and a fan. All include 1 surf lesson per day. At Costa Rica Surf Camp by SUPERbrand you will find a private beach area and a tennis court Other facilities offered at the property include a tour desk and luggage storage. The property offers free parking. 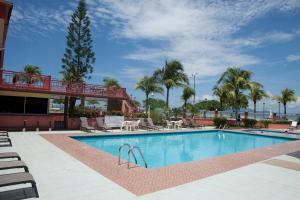 This resort is 39 mi from Juan Santamaría International Airport. Please note that fridges are available under request and have an extra cost. Not all rooms have a surf lesson includes, please note that at the name room. great feelings about hotel , breakfast was similar for every day, but you can have omlet or fried eggs , toasted bread, fruits and coffe. ( quess we have little spoiled about Thay food :) ) Hotel room was clean, conditioner was worked well. Great location near to ocean large beach, where you can relax, because there no mass of people. Travel office in middle of hotel area was supprisingly non proffessional in my eyes- some lady spoked all the time with somebody by phone and no real attention for stepped in customers, suggestions for trips was poor. Then confusion with payment summa and for last supprisingly asked 5% extra for credit card payment !!! ? We had to pay cash. Travel office is shame for this nice hotel. Warm greetings to all hotel staff and surf course trainers, thank you all for great job! Very quiet at night but easy walk into town. Would have been better to have a fridge in the rooms and maybe a disco, there's a casino but I'm not into gambling. Pricy drinks if not on all inclusive plan. Nice pools and easy access to the beach and town. Good for the price overall.